Integrated security manufacturer TDSi will again be supporting Dorset-based children’s hospice Julia’s House by naming the organisation as its charity beneficiary in 2019. The announcement follows a programme of successful activities last year which included a ‘Change for Change’ collection day, a Halloween ‘Bake-Off’ event, participation in the gruelling Tough Mudder and ‘Christmas Jumper Day’. With many Armed Forces veterans presently working in the security sector, the charity PTSD Resolution is this year sponsored by ASIS UK, who are organising a series of fundraising events. Free of charge, the charity (No. 1133188) helps veterans and reservists who are struggling to reintegrate into a normal work and family life because of military trauma suffered during service in the Armed Forces. The charity has helped to resolve mental health issues for over 1,400 veterans. Nearly eight out of ten of them say that they require no further treatment after completing the treatment programme. Donations to the Armed Forces veterans’ charity will be doubled when donated online in the 72 hours from 12.00 pm on 29 November – visit the Big Give (https://goo.gl/sVV8pD). PTSD Resolution was selected to participate in the Big Give Christmas Challenge 2016, which is the UK’s largest match funding campaign. Last year, the campaign raised over £7.2 million for participating charities. The treatment programme is community-based, with therapy and support provided locally. Trauma causes flashbacks, nightmares, anger and depression – often leading to violence, alcohol and substance abuse, job loss, family breakdown and even suicide. PTSD Resolution’s therapy is brief, with an average of just five sessions usually required, and conducted on an out-patient basis, which supports family and work routines. The programme is complementary to the work of other services’ charities in that it resolves the mental health issues that can serve as barriers to successful reintegration and settlement. 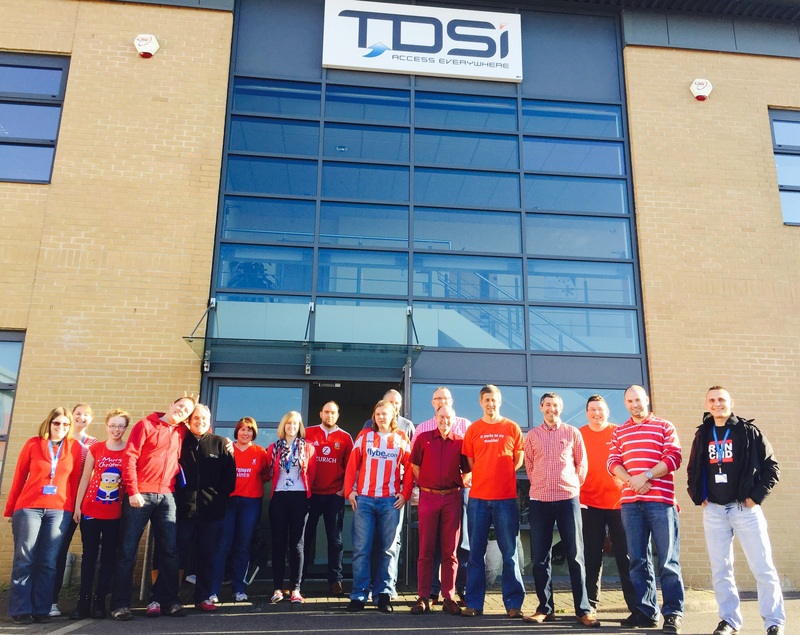 The dedicated team at integrated security solutions development specialist TDSi recently supported the British Heart Foundation’s ‘Wear It… Beat It’ fundraising day by wearing red and enjoying a fine selection of red food. Embracing the spirit of the event, the TDSi team members each came to work wearing a red item of clothing (donating £1 each to the charity in order to do so) and enjoyed a delicious selection of red-coloured foods including home-baked cakes, sweets, jellies, fruit and fruit-flavoured drinks along with an array of suitably coloured delicatessen meats. The event has a serious side, though, in terms of raising awareness around serious health issues. Indeed, the British Heart Foundation charity estimates that one-in-four individuals will suffer from heart and/or circulatory disease at some point in their lifetime. The event follows a charity Bake Off challenge held at the company’s Poole offices last November in aid of the Boo charity. Members of the TDSi team competed to produce the best sweet treats as judged by a panel of staff members. Established in 1982, TDSi has been at the forefront of the access control and integrated security management market for over 30 years. The company’s diverse and comprehensive product range encompasses access control systems, biometric readers (fingerprint and facial), security management software, IP CCTV cameras and storage media and Video Management Software. Its portfolio of solutions can be easily integrated with other security and BMS applications and may be deployed at businesses and organisations of all sizes and types. With customers all around the world, millions of people rely on TDSi cards every day to gain secure, reliable access to installations. ISO 9001 accredited, TDSi’s access control systems range from standalone products to networked and integrated systems for all sectors. The company serves end user customers across a wide range of sectors, among them healthcare, finance/banking, education, transportation (including ports and airports) and the utilities as well as industrial and commercial/retail sites. Clients include Bristol International Airport, the University of the West of England, Guildhall School, Natwest Bank, Bentley Motors, Vodafone, Université de Caen, CHU de TOURS, Ecole Centrale de Nantes and Arcelor Mital. The Security Institute has announced that its designated Chairman’s Charity for 2015 will be Help for Heroes. The charity offers comprehensive support to British servicemen and women who have been wounded or injured in the line of duty – a cause that’s clearly close to The Security Institute’s heart in light of the fact that many of the organisation’s members have served their country across the Armed Forces. Since its founding in October 2007, the money raised by Help for Heroes thanks to hugely generous public backing has been used to support the wounded, but there’s still so much more to do. Soldiers, sailors and airmen injured today will still need vital support tomorrow and in the days that follow.